“I said we need you to move, Jon,” Tam was saying, standing beside Jon. Jon obeyed uncertainly, still staring at the mark on his hand. Tam and Djaren pulled as hard as they could on the lid of the coffin. It slid slowly. Inside the stone coffin was a painted clay sarcophagus. Djaren and Tam hauled the stone lid across the floor, and with Kara and Anna’s help began to wedge it against the door. “Father will understand if we break some things,” Djaren said, trying to lift the heavy slab to lean on the door. “You just stay there safe,” Tam added, helping with the other end of the slab. There was a loud noise from the opposite side of the door, and the door shuddered. It began slowly to scrape open. Anna shouted. The children tried to push the door back, to hold it motionless, but despite everything it scraped further and further open. A robed arm reached through the widening crack. Kara stabbed it. There was a yell, but the door was shoved open faster now, and there was room for the men to enter. Kara sprang to one side of the door, and Tam, grabbing his swords, ran to the other. Tam hit the next man to come through square over the head, and he fell over. Kara nodded at Tam with grudging respect, and jabbed at the next man’s foot. The next thing to come through the door was a thrown cloud of dust and debris, which took Kara and Tam by surprise. They stumbled back, coughing and rubbing their eyes, and before they had recovered, the rotting man had come through the door, with more of his men immediately behind. The rotting man took one look around the room, and his clouded, corpse-like eyes settled on the lid of the coffin. He looked from it to Jon, and his face twisted. Jon took a step back. “I can’t,” Jon said, stepping back. He found himself with his back to the stone coffin. “I will take it from you. Stand still and do not resist me,” the rotting man said, reaching a withered hand toward Jon. The hand had only three fingernails on it, and they were yellow and cracked. One was falling off. Jon shrank away. “No!” Ellea yelled, suddenly between them. She glared hard at the rotting man, and then looked surprised. She glared at him again, uncertain, and then looked scared. “So very much promise. But you still have so much to learn,” the rotting man said, and stepped toward her. Djaren leaped across the room and pushed Ellea out of the way. “Leave them all alone! I won’t let you hurt them. You want me, fine, but you’ll never hurt them. I’ll stop you.” He stood before the rotting man, bronze sword in hand. The rotting man laughed, and reached out a decaying hand for Djaren’s throat. Kara stabbed the man then, from behind, with a wordless cry. He wheeled around and grabbed her with both hands before she could get away. “No!” Djaren screamed, stabbing the man with the bronze sword. The rotting man ignored him. He did not even seem to notice. He lifted Kara by the throat, a gruesome smile on his cracked gray lips. Slick blackness oozed from his rotting fingertips onto Kara’s skin. She struggled wildly. The rotting man’s expression changed suddenly. The blackness was not spreading. There were no green veins, and Kara’s skin did not change color under the rotting hands. Kara’s eyes were wide and horrified. Djaren’s repeated stabs into the rotting man’s back were having no effect. With a strength Jon had never seen his brother wield, Tam brought the stone coffin lid down with a sickening crunch on the rotting man’s head. He fell, dropping Kara, and lay buried under the slab. Green and black fluid oozed from under the stone. The remaining men in robes stared down at the mess, turned their backs, and left without a word. “Let’s get out of here,” Djaren said, grabbing Kara’s hands and helping her to her feet. She was shaking. The children followed the curving tunnels back out into the light, trying not to look too closely at the forms they passed. Kara had nothing sarcastic to say, and no one seemed to want to be the first to speak. Ellea held tight to Djaren’s hand, and Jon stayed close to Tam. In an uncharacteristic display of concern, Kara helped Anna over the boulders in the section with the fallen ceiling. They emerged silent into the young night, to find themselves in the north corridor, beside the open door. Stones rattled in the passageway ahead. Djaren made a sign, and the children stopped, listening. “We have the man you call,” an accented voice came from out of the shadows ahead. A robed man came around the corner. 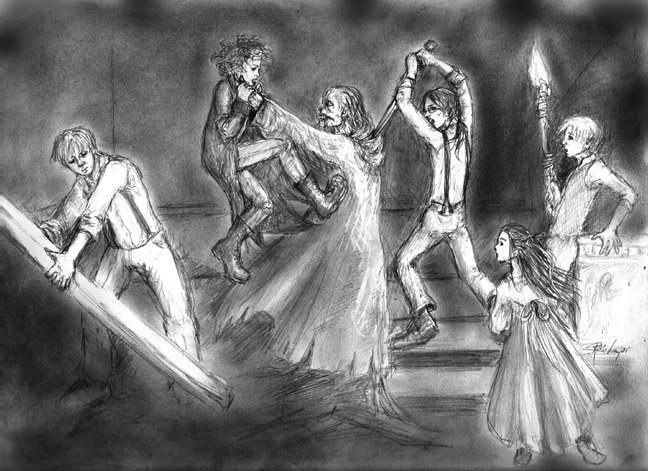 Four more men with torches followed him, holding the Professor, who was bound and looked a little the worse for wear. His face was bruised, and blood trickled down from a shallow cut on his temple. He looked at them eagerly. “Thank the One, you’re all right,” he breathed. One of the robed men struck him. Djaren cried out in protest. “Yes, Ma’am,” Tam said grimly. Djaren had kept his bronze sword with him, Jon noted. Tam pushed Jon behind him and Djaren did the same with a protesting Ellea. Anna stood beside Kara and gripped her belt knife. There was a sound behind them. Jon and Ellea heard it first, then Djaren and Kara. They turned slowly to look back into the passage. “That can’t be right,” Tam muttered, looking where the others were looking. Lurching slowly into the torchlight came the rotting man. He was dragging one twisted arm behind him, and half his skull was shattered. His left leg bent oddly beneath him as he staggered forward, one unnatural step after another. The children backed away, to find themselves surrounded again. “We’d hoped you would know, sir,” Djaren said, edging further away from it. “I’ve never,” the Professor began. The Professor’s brow creased. “No,” he said softly. There was a sharp, high cracking sound and the corpse-creatures “good” arm was blasted away. All eyes went to the ledge overlooking the corridor. Hellin Blackfeather stood there, face lit in torchlight, form outlined by a sky full of bright desert stars, her copper hair flying loose about her and her pistol leveled now at the rotting man’s head. Jon could see Doctor Blackfeather. 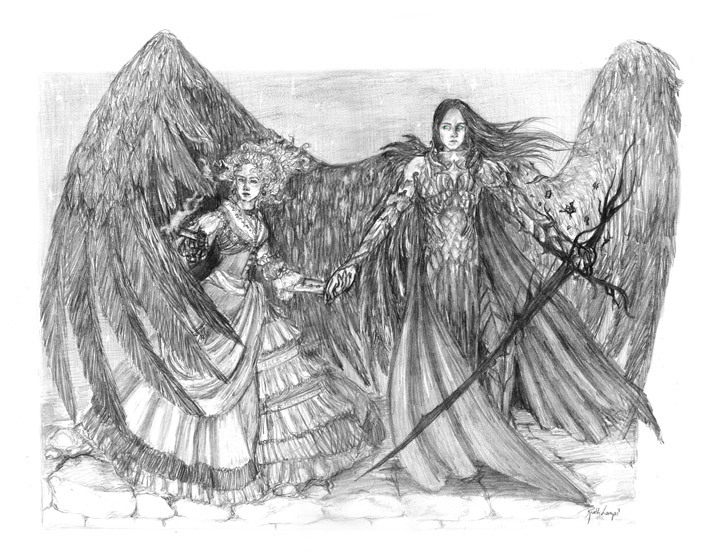 He stood beside his wife, his huge black wings outstretched about her, forming even as Jon watched from the darkness of the spaces between stars, and the long shadows cast by torches. He wore armor of obsidian scales and held in one hand a strange sword of black nothingness that flickered and writhed like a flame. Kara’s open-mouthed stare informed Jon that she could see him too. “If it was, I’d say you were in a sorry state indeed. Who did you steal that from?” Hellin asked coldly. Her pistol hand did not change its aim. “Does it matter?” the corpse cackled. 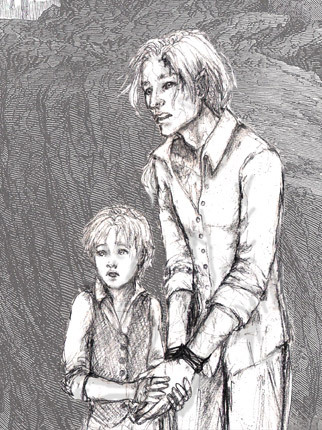 “Do you remember, Corin lad, that it was nearly you, eighteen years ago? That would have been interesting.” The rotting man looked right at the Doctor; he could see him too, though evidently the other robed men could not. “And do you remember what we did to you, eighteen years ago?” Hellin asked. “And I thought you’d never get to the point,” Hellin sighed. One of the robed men pushed Eabrey away to join the children, and began to level a rifle at him. Hellin shot the man, with a crackling copper flash, but another man raised his rifle in turn and trained it on the Professor. “Answer,” the corpse man said, grinning. The corpse grinned wider. “Because it is in my keeping. As are your children, Hellin,” he said, looking up again at Hellin. He frowned, suddenly. Jon saw why. Doctor Blackfeather was no longer on the ledge. He was nowhere to be seen. The Professor flinched. Jon grabbed his hand in both his own, wishing Doctor Blackfeather would act fast, wishing for a miracle. The tingle in his hand became a rush as something pulsed all through his arm, through his palm, and the Professor gripped his hand more tightly. Jon could not close his eyes, though he wanted to, as the robed figures all raised rifles to point at the Professor. Jon felt something odd, and saw a metallic gleam moving out of the corner of his eye. A sheet of liquid silver flowed up across the Professor’s chest from their joined hands, as the first rifles barked. Hellin was already firing her pistol at the rotting man. He fell to the ground but was still moving. Something dark and shadowy was moving among the robed man, wielding a black flame like a weapon. Even as the rifles fired, they were sheared in the wake of the fury of Doctor Blackfeather. His eyes burned an unearthly glowing green, and his hair and robes billowed about him in an unseen, unfelt wind. Form after form was cast either into the walls, or up and out of the excavated trench altogether, thrown like straw dolls. Bullets struck and bounced off the silver armor that covered the shocked-looking Professor. John found his own arm covered in the silver as well. It was cool, and molded to his shape. The rotting man had taken cover behind the children, and Hellin was maneuvering for a clear shot at him. Kara dashed up to stab him, but before she could, his remaining broken limp arm twisted suddenly round and grabbed Djaren. Kara stopped, staring horrified first at Djaren’s face, and then at the rotting man. Kara threw her dagger at the same time as Djaren stabbed the man and Hellin got her shot at last. Bits of rotting man covered both Djaren and Kara. They stared at each other. There were quite suddenly no enemies left to fight. Jon, gripping the Professor’s hand hard, looked up at him. The Professor was staring with wonder at his chest. A sheet of liquid silver armor covered the front of his body. A number of bullets were scattered at his feet. Jon began to release his hand, and the silver melted away. When Jon lifted his palm to examine it, the emblem there was very bright. “What got the others?” Tam asked, looking up and down the corridor in confusion. Text and illustrations by Ruth Lampi. Originally serialized on World of Shandor.